So you think you know what your zodiac sign is? Think again! Discover your Zodiac Sign Love Compatibility. The human personality is complex and cannot be completely defined by the characteritics of a single zodiac sign. 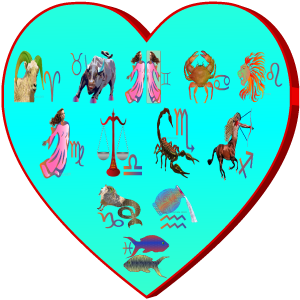 How compatibile are your zodiac characteristics with that of your partner's? This sophisticated zodiac sign calculator compares the astrological influences that make up the personalities of two individuals, based on the choices made. At PowerFortunes.com we have created a unique zodiac calculator that works out exactly what ratio of different zodiac signs make up your personality. This calculator is based on a simple, but precise algorithm, using certain principles of Vedic astrology, Western astrology and numerology, to work out and compare your correct sign composition. This result does not describe the overall success or character of a relationship. This calculator indicates similarities relating to the above mentioned characteristics. For a comprehensive relationship comparison, a detailed matching of horoscopes, through a Astrology Compatibility Report, is required. Enter your partner's first name. Try the Zodiac Sign Calculator for individual characteristics.